Sorry Idaho, Long Island in New York has the best potatoes in the world (unless the potatoes are grown in your garden, those are always the best). And, it turns out, Long Island also gives us one of the best potato recipes in the world, new potatoes with brown butter and herbs. This recipe is one of the best “easy” recipes for any vegetable you can get. But before we get to the recipe, let us explain the deal on potatoes from Long Island. Long Island, as we know it, formed about 21,000 years ago during the last major ice age and is what geologists would call a glacial moraine. Basically, as the ice crept down over New England it scraped up all the good topsoil and pushed it into a big mound in front of the glaciers. When the glaciers receded, the mound of topsoil was left, and we get Long Island. Long Island’s soil is a mixture of sand, gravel, silt, clay and topsoil that ends up being a great fit for agriculture. What the soil and moderate summer temperatures get you is very productive land and very flavorful crops. And potatoes are a perfect fit for the land and climate. Long Island potatoes simply taste more “potatoey” than any we have tried- except the ones we dig up and eat from our garden. Generally we think Long Island potatoes are the best. To be fair, Idaho has great soil for potatoes, but the soil comes from ancient volcanic activity. So maybe “different” could be a better adjective. But Long Island potatoes (or almost any “legal” crop) cannot compete against real estate development. So while Long Island has great produce, sadly, it might not with us much longer. Now we believe in eating “local” as much as we can, and when we were last in Long Island (we go almost every summer) we not only used local potatoes, we used a local recipe. In this case the recipe is adapted from Ina Garten, of Barefoot Contessa fame. The Barefoot Contessa started as a catering company in East Hampton and they do know what to do with Long Island potatoes, which is to say “not much”. 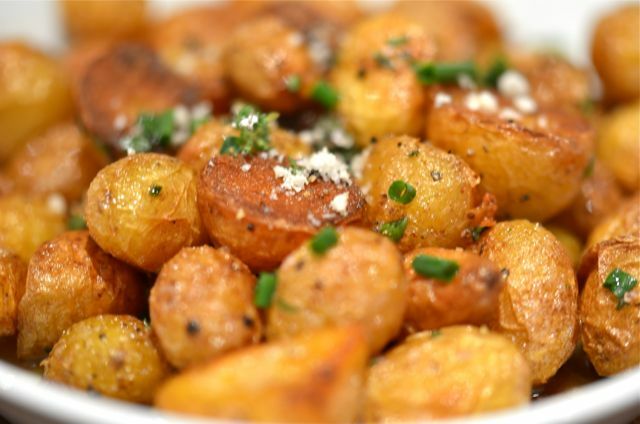 This is a simple recipe that both steams and lightly frys small potatoes in butter, salt and pepper, and the then finishes with fresh herbs. The cooking technique provides a combination of crisp outsides with very moist insides and a fluffy texture. The herbs add extra flavor and aroma. But the real kicker is that the butter browns during cooking, and brown butter is very tasty stuff- sweet, nutty and complex. And you get this with just a few easy steps and about 3/4 hour of cooking. Good stuff. In this case, we used our new potatoes from the garden (nothing wrong with a California potato). We have a mix of yellow Yukons, red fingerlings and purple in our garden, but for a consistent result we use one variety, the new Yukons. And by “new potato”, we mean “new” as in recently harvested and small (about an inch across or smaller). You can get these in spring and fall at many farmers markets. 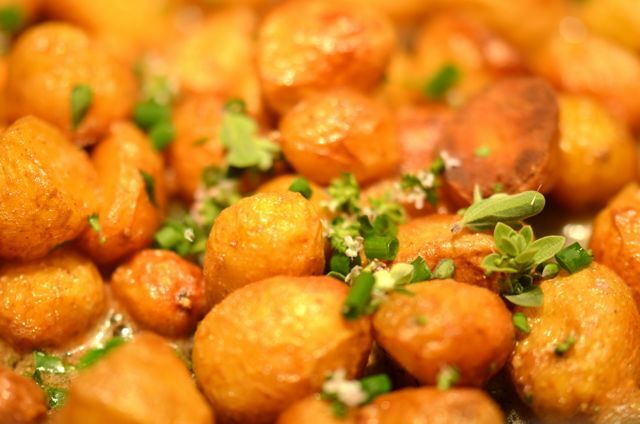 The little “marble” potatoes are particularly good in this dish. You simply rinse the potatoes, but keep the skin on. 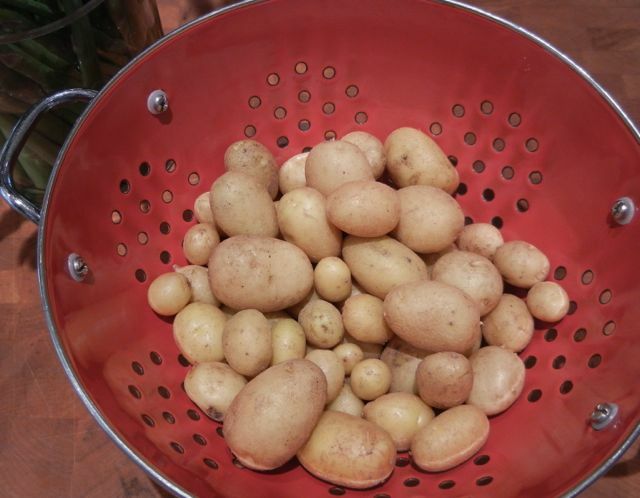 You can also cut any larger potatoes into smaller sizes, you want the potatoes roughly the same size. Then, in a large, heavy, lidded pot, you melt the butter and then add the potatoes, salt and pepper. 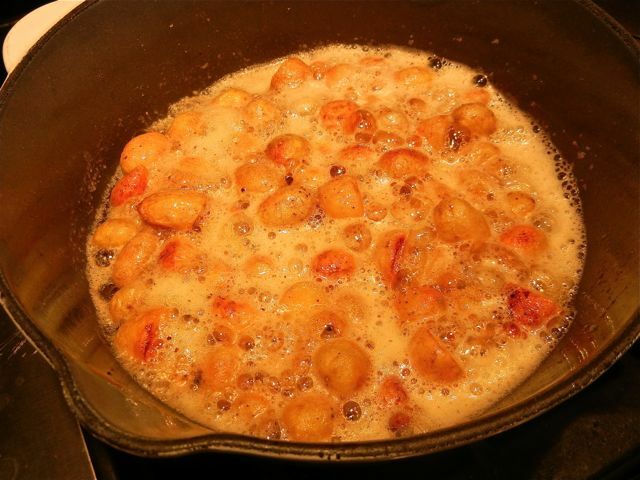 Lower the heat, cover the pot and let the potatoes cook for 20 to 30 minutes. Just give them a shake every few minutes to avoid sticking. After about 20 minutes, test for doneness (just pull a potato, cut it, let it cool for a minute and taste it) . When the potatoes are tender, turn of the heat and let the potatoes steam, covered, for another 5 minutes. 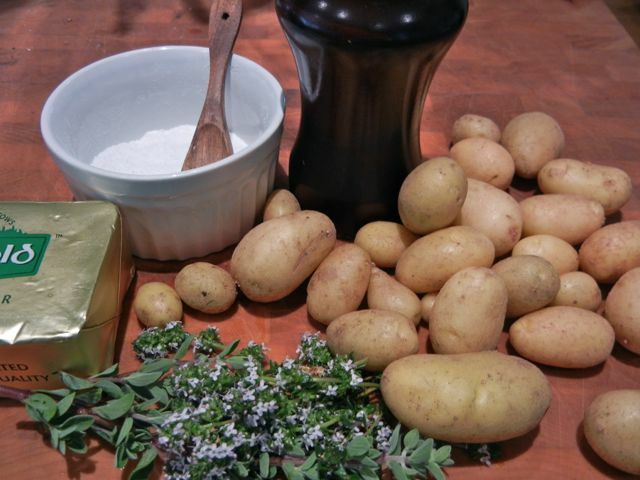 So if you cannot get to Long Island or grow your own potatoes try this recipe. You will still get a taste of how good new potatoes can be. 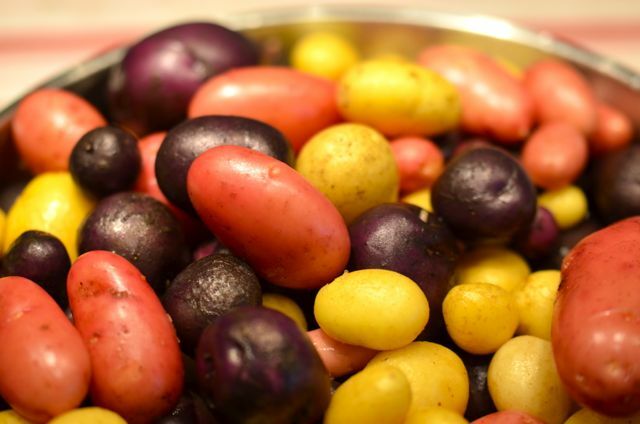 Any small “new potato” will work for this dish, but Yukon, Fingerling and Bintje are very tasty. Different potatoes have different cooking times, it is best to use just one variety in this dish. 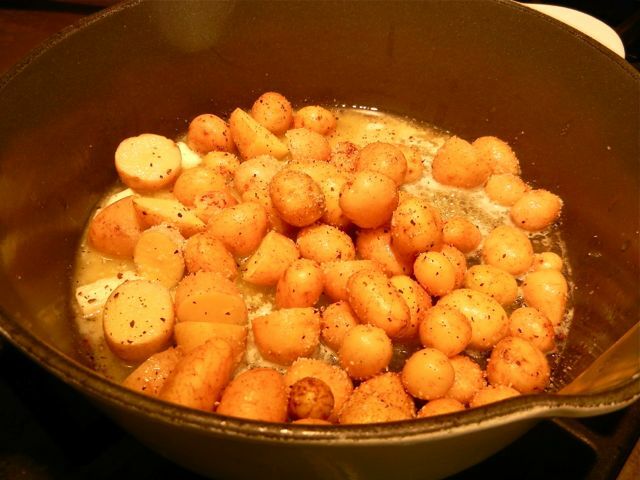 What You Get: Tasty potatoes and brown butter with almost no work- what’s not to like? How Long? About 35-40 minutes total time. 5 minutes of active time. This is an anytime dish. 2-3 pounds of small new potatoes, rinsed and cleaned but with skins still on. 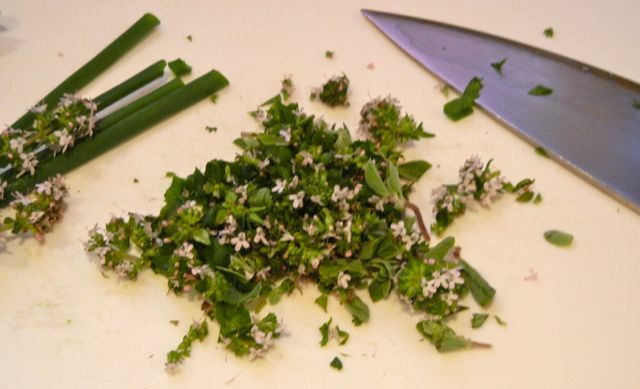 3 tablespoons of roughly chopped herbs like parsley, chives, thyme, dill or rosemary. Add or subtract, to taste. Place a heavy, lidded pot over medium heat. Add the butter and when it melts, then add the potatoes, salt and pepper. When potatoes are tender, turn of the heat, but keep the lid on. Let potatoes steam for 5 more minutes. Meanwhile, roughly chop the herbs and then add them to the potatoes. Stir, test for seasoning and serve while warm. Thanks! We love the recipe- we made it the minute we dug up our potatoes. Really good. Thx for reading! I don’t cook often, but this is making my mouth water. I’m going to have to try it when I can get my hands on some new potatoes. Oh gosh, my mouth is watering. I love new potatoes and butter beans. Wonder if this recipe would be good with sweet potatoes too? My aunt and uncle are farming potatoes this year in their garden… we’ll totally give this one a go if they yank any new potatoes up!! I roasted some potatoes tonight, but these, just by looking at the appetizing photos, put mine to shame! 🙂 YUM! !